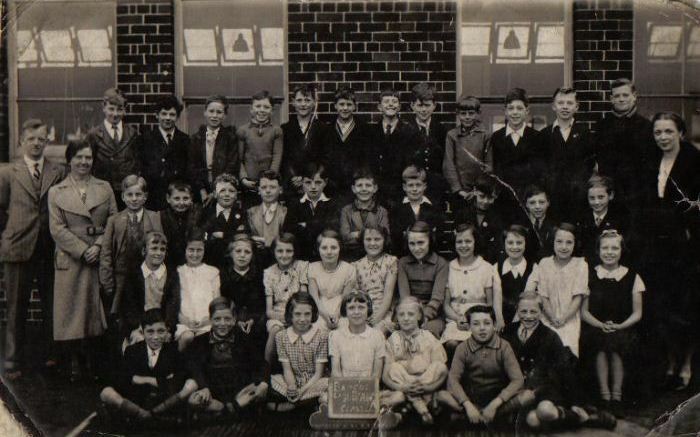 Briscoe Lane Primary School – Miss Owen’s Class – 1938. Courtesy P. Stanley. 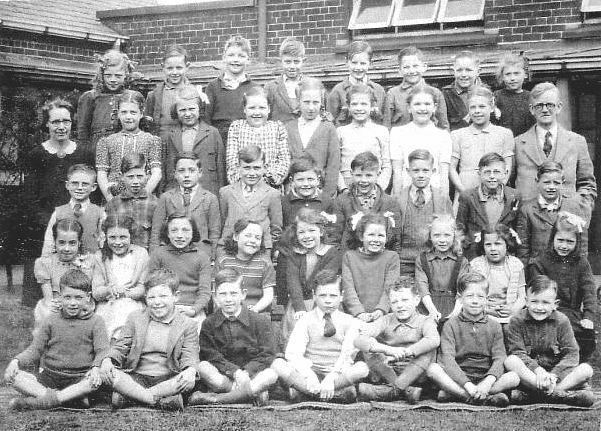 Briscoe Lane Primary School in Newton Heath – Miss Owen’s Class of 1938, taken in the playground at the east of the building. 3rd row from left: 13. Mr Bowkett 14. Miss White 25. Margo Owen (née Ingham) art teacher. Thank you to J. Palmer for their invaluable help in writing this post. 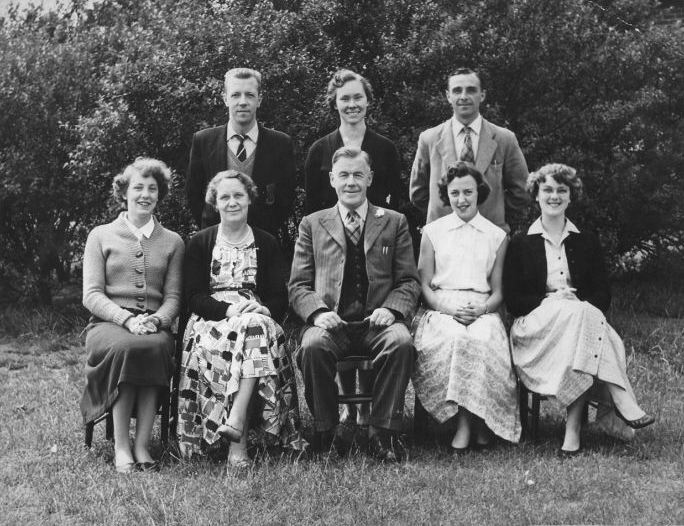 Briscoe Lane Primary School staff photograph – 1959. Courtesy P. Stanley. Briscoe Lane Primary School in Newton Heath– Staff photograph from 1959. Back row from left: 1. Mr Burrows 2. (UNKNOWN?) 3. Mr Bannister. 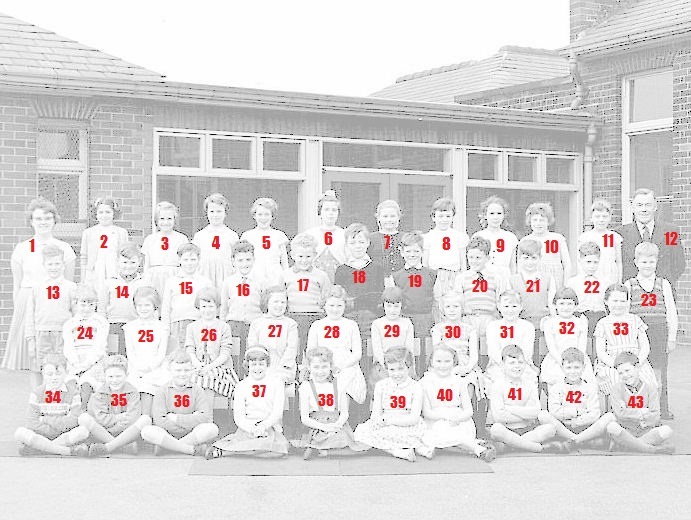 Briscoe Lane Primary School – Class of 1961. Courtesy of P. Stanley. 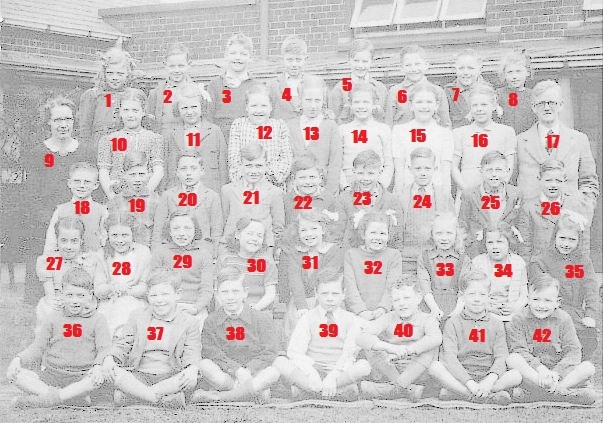 Briscoe Lane Primary School in Newton Heath – Class of 1961, taken in the playground at the south of the building. Back row from left: 1. Miss Lambert 2. Jean Spriggs 3. Carol Donbovand 4. Gail Freeman 5. Ann Rowton 6. Joan Ellem 7. Jeanie McCloglan 8. Linda Whiteoak 9. Pamela Fortune 10. Mavis Heaps 11. Linda Saunders 12. Mr Thornburrow. 3rd row from left: 13. (UNKNOWN?) 14. Eric Charnock 15. (UNKNOWN?) 16. Clive (UNKNOWN?) 17. (UNKNOWN?) 18. Billy Fitton 19. Jimmy Walmesly 20. Malcolm Hunt 21. Paul Stelmack 22. (UNKNOWN?) 23. Colin Witherford. 2nd row from left: 24. Ann Earnest 25. Nerys Jones 26. (UNKNOWN?) 27. Ann (UNKNOWN?) 28. Marilyn Barber 29. Christina Green 30. Lynn Simpson 31. (UNKNOWN?) 32. Jean Bamber 33. (UNKNOWN?). Front row from left: 34. Raymond Cosgrove 35. Alan Slack 36. Brian Heavyside 37. Stephanie Greenough 38. Susan Forge 39. June Halstead 40. (UNKNOWN?) 41. (UNKNOWN?) 42. (UNKNOWN?) 43. Dave Wilson. Briscoe Lane Primary School – Mrs Dunn’s Class c1980. Courtesy P. Stanley. Back row from left: 1. Sean (UNKNOWN?) 2. Matthew Walsh 3. Christopher Toft 4. (UNKNOWN?) 5. Lee Bowles 6. Neil (UNKNOWN?) 7. Damian Anderson 8. (UNKNOWN?) 9. Colin (UNKNOWN?) 10. Mrs Dunn. 2nd row from left: 11. Stephen Hopkins 12. David (UNKNOWN?) 13. Nicola Holt 14. (UNKNOWN?) 15. Sarah (UNKNOWN?) 16. Jennifer (UNKNOWN?) 17. Natalie McCadden 18. Jodie (UNKNOWN?) 19. Paul Thomas. Front row from left: 20. Adele Shenton 21. Jamie (UNKNOWN?) 22. Dawn Turner 23. Sam Flinn 24. Joanne Swan 25. Michelle (UNKNOWN?) 26. Deana Dixon. 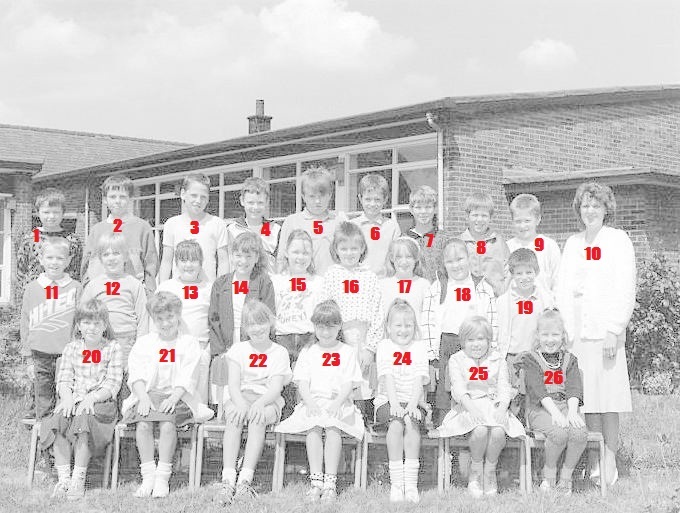 Briscoe Lane Primary School – Mrs White’s Class of 1981/1982. Courtesy P. Stanley. Back row from left: 1. Mrs White 2. Dale (UNKNOWN?) 3. Lee Bowles 4. Neil (UNKNOWN?) 5. Christopher Toft 6. Craig (UNKNOWN?). 2nd row from left: 15. Joanne Swan 16. Jodie (UNKNOWN?) 17. Deana Dixon 18. Adel Shenton 19. Marie (UNKNOWN?) 20. Dawn Turner 21. Michelle (UNKNOWN?). Front row from left: 22. Sean (UNKNOWN?) 23. Karl (UNKNOWN?). 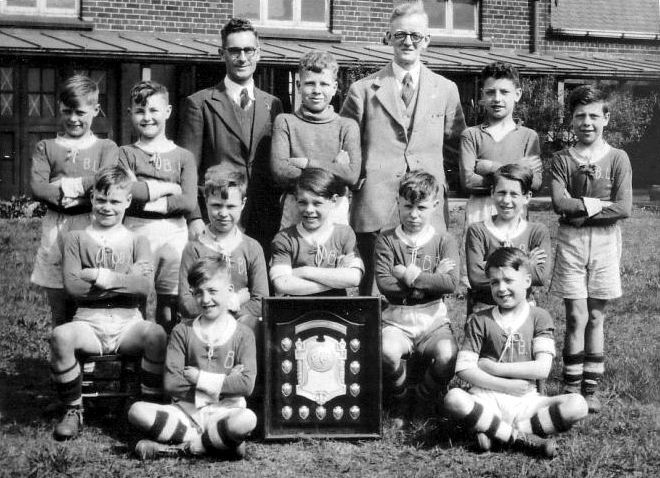 Briscoe Lane Primary School Football Team of 1946. Courtesy P. Stanley. 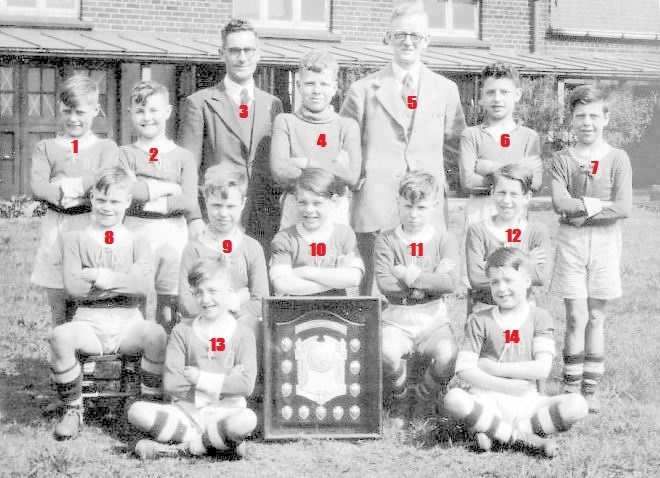 Briscoe Lane Primary School in Newton Heath football team of 1946. Back row from left: 1. J. Dermody 2. A. Appleby 3. Mr Hoffman 4. C. Major 5. Mr Bowkett 6. G. Nolan 7. R. Heaford. 2nd row from left: 8. R. Saville 9. R. Nixon 10. S. Anderson 11. J. Bell 12. A. Green. Front row from left: 13. J. Brown 14. D. Mergatroyd. Briscoe Lane School. 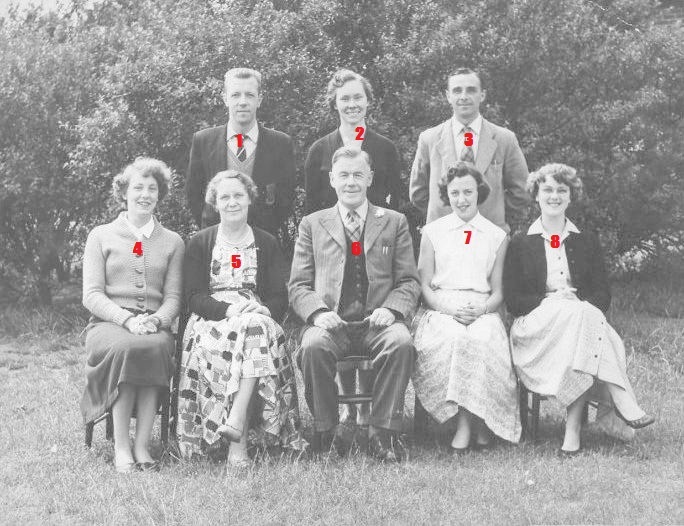 Class of 1948. Courtesy of D. Smith. Briscoe Lane Primary School in Newton Heath – Class of 1948. Back row from left: 1. (UNKNOWN?) 2. (UNKNOWN?) 3. George Pope 4. Victor Wall 5. Malcolm Davies 6. Ronnie Cashinella 7. Bernard Gunning 8. Pauline Godson. 4th row from left: 9. Miss Lord 10. Pat Harris 11. Marilyn Gallagher 12. Edna Hilton 13. Pat Cary 14. Majorie Jackson 15. Yvonne Gee 16. (UNKNOWN?) 17. Mr Bowkett (Headmaster). 3rd row from left: 18. Roy Harrison 19. James Palmer 20. Patrick Duffy 21. Terry Walker 22. (UNKNOWN?) 23. Alan Kirby 24. David Hudson 25. Roy Power 26. Bryan Morris. 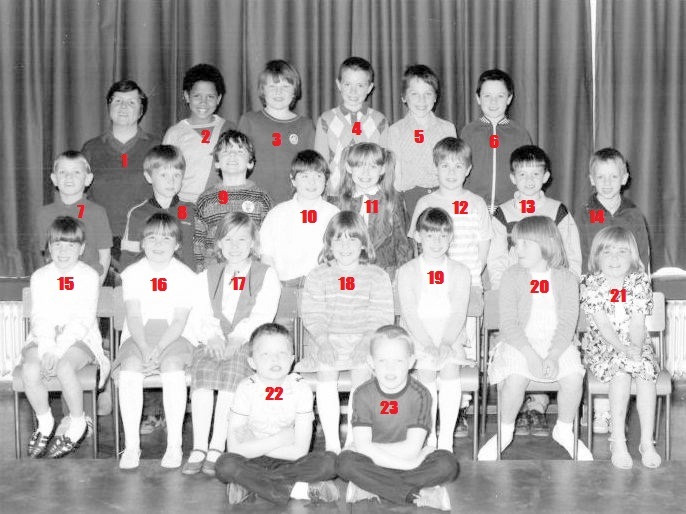 2nd row from left: 27. Carol Norman, 28. (UNKNOWN?) 29. Ida Hall 30. 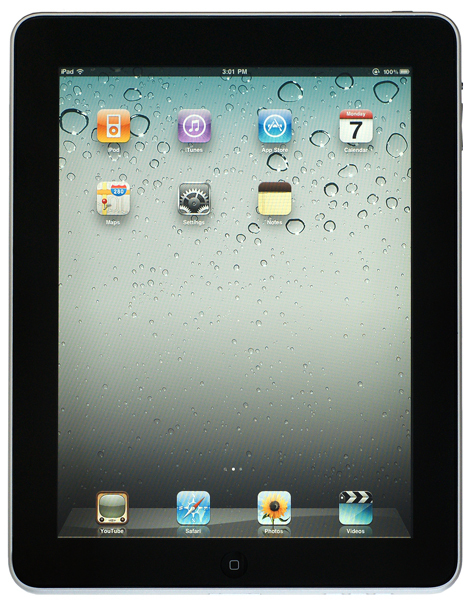 Joan Bell 31. (UNKNOWN?) 32. (UNKNOWN?) 33. Jean Parker 34. Maureen Holmes 35. (UNKNOWN?). Front row from left: 36. Ronnie Elphick 37. Billy Keiley 38. Tom Chidley 39. Eric Hardman 40. Dan Hartley 41. Kenny Heaford 42. Tommy Brogan. 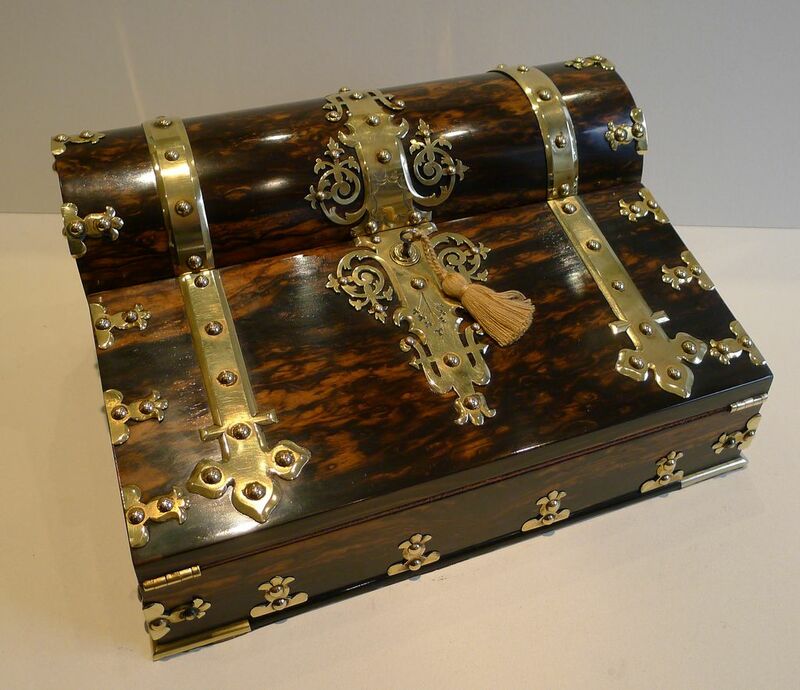 Writing Box c1850. © 1998-2012 Ruby Lane Inc. In the 21st century it seems the art of writing if not dead completely will soon be resigned to pages of history. Some even foresee the book will follow suit in the coming decades with the continuing and unrelenting rise of digitzation. Certainly the digital natives; tech savvy children amongst us will have little knowledge of this long period in our history and in an age of mobile instantaneous, few will look to indulge beyond the most enquiring graphic designers, artists or those who received a calligraphy set as a Christmas or birthday present. Even digital immigrants have increasingly forsaken this once most personal form of communication. 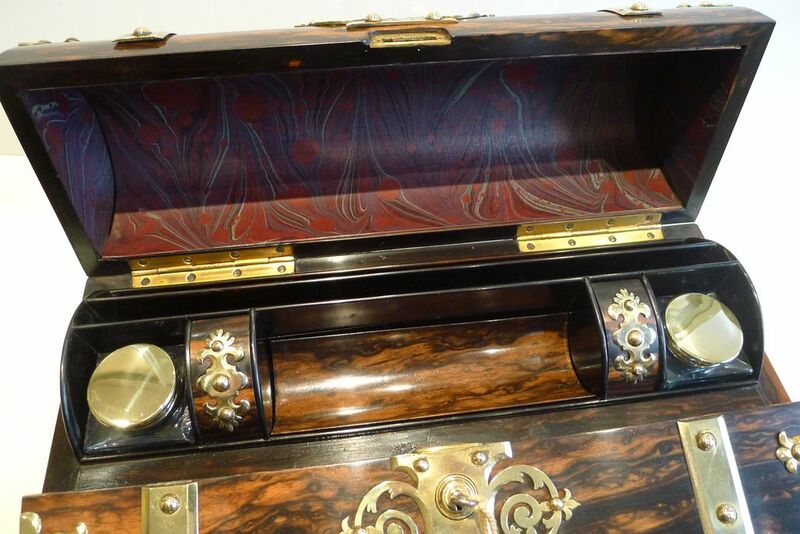 Fine detail of the writing box on display. © 1998-2012 Ruby Lane Inc.
Whilst looking at the picture of the ornate and beautifully and skillfully crafted writing box or “Victorian laptop” (Catherine Golden 2010) dating to around the 1850s, made from Indian Calamander wood or Coromandel wood and decorated with ornate brass mounts, one can with a little imagination see the similarities with its modern 21st century counterpart, the iPad; communication and portability; high end craftsmanship and quality; beauty and design; functionality and practicality; attention to detail and mass production. This is a postcard of Piccadilly Gardens from 1949 viewed from Portland Street. Courtesy of R.Jones. 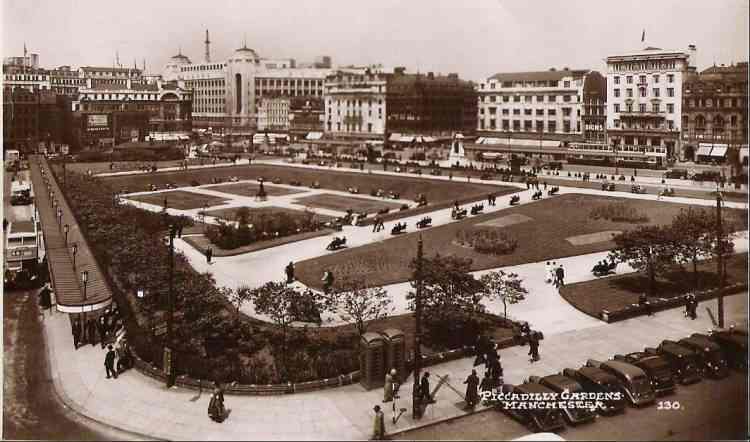 This is a postcard of Piccadilly Gardens in 1949 viewed from Portland Street. The printer or maker is unknown. Piccadilly Gardens after Tadao Ando’s design and development. Courtesy of P. Stanley. 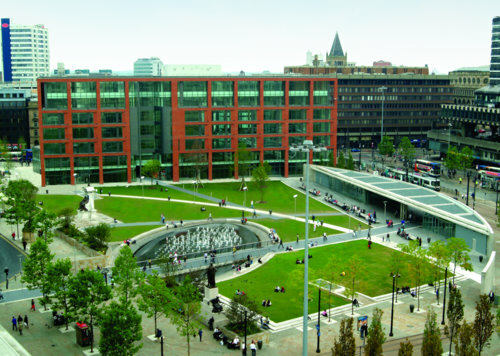 For most Mancunians, Piccadilly Gardens has traditionally been the centre of Manchester. This is due to Piccadilly Gardens being at the centre of public transport and also as it is a rare and much treasured green oasis in and amongst all the stone and brick and in 2012 concrete that enwraps it. Unlike London which developed many large and impressive inner city parks, the relentless march of industry in Manchester throughout the 18th and 19th century saw most of Manchester’s inner city green space decimated and torn up to be replaced with factories, mills and warehouses. Buildings of round-the-clock toil and sweat, commerce and business and billowing chimneys; the pillars of industry that once proliferated the landscape and drove and transformed Manchester into world renowned metropolis of cotton – Cottonopolis has it was known worldwide. Within this transformation, where once green space and open fields were plentiful, land was now carved up and sold off to industrialists and men of ambition. This was the birth of the modern city and the defining separation from the countryside where our ancestors had worked and lived their lives for centuries. The Murder (Abolition of Death Penalty) Act came came into power in 1965 ending 305 years of capital punishment in the United Kingdom. For over 3 centuries state sponsored death had been used to uphold the laws of the time and protect the interests of those in power and the society it governed. Peter Allen and Gwynne Evans in 1964. 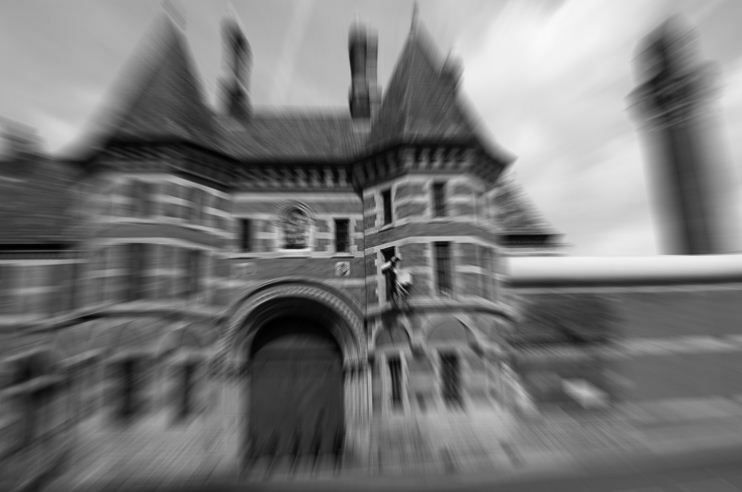 At Manchester’s notorious Victorian Strangeways Prison, 24 year old Gwynne Owen Evans was hanged for the capital murder of John West whilst at the exact same time 21 year old Peter Allen was hanged at Liverpool’s Walton Prison for his role in the murder. Both held out for a reprieve, which would never come. Unknowingly, they would both enter the dark annuls of history as the final victims of a cruel chapter in our forgotten history. 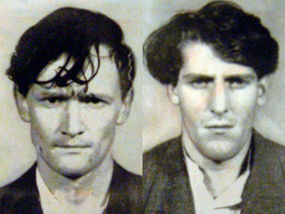 We cannot know what their last thoughts must have been as they resigned themselves to the will of a society that sought justice and retribution for the murder of 53 year old John Alan West who they fatally stabbed in a bungled burglary. 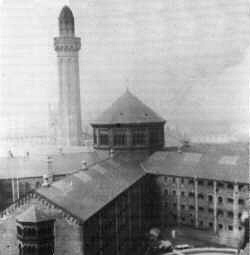 Strangeways Prison built in 1861 and shown here in the early 1900s showing its Victorian Panopticon design. Britains leading hangman Albert Pierrepoint made a gruesome craft of hanging, but even his skill and indeed that of the executioner Harry Allen could never have hoped to curtail the psychological suffering the majority of us pray will never know. The appalling conditions they must have endured whilst they awaited their fate and which many people around the world continue to endure today and like Evans and West become victims of societies that exact the most barbaric and inhumane justice for heinous crimes that they believe misguidedly will rid society of its ills.